Dr. Owen Geiger and I have just found that a book published in 1990 in Germany, Building with Pumice, written by Klaus Grasser and Gernot Minke, describes experiments done in the 1970’s at the Research Laboratory for Experimental Building at Kassel Polytechnic College in Germany that have considerable bearing on the history of earthbag building. 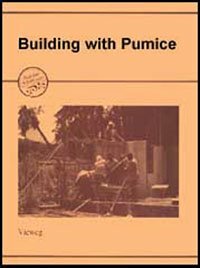 Most of the book is about the physical properties of pumice, how to obtain and process it, and how to make blocks or walls with pumice/cement, but the fifth and final chapter, titled “Building with Unbonded Pumice,” describes how they began to investigate the question of how natural building materials like sand and gravel could be used for building houses without the necessity of using binders. The use of fabric-packed bulk material was found to be a cost-efficient approach. They used pumice to pack in the bags, because it weighs less and has better thermal insulating properties than ordinary sand and gravel. Their first successful experiments were with corbeled dome shapes (an inverted catenary) which was obtained with the aid of a rotating vertical template mounted at the center of the structure. 1978, a prototype house using an earthquake-proof stacked-bag type of construction was built in Guatemala. They used cotton bags soaked in lime-wash to protect the material from rot and insects. When flattened, the bags measured roughly 8 X 10 cm. Vertical bamboo poles placed on both sides of the bags and interconnected with wire loops gave the stacked bags stability. The bamboo rods were fixed to the foundation and to the horizontal tie beam at the top. 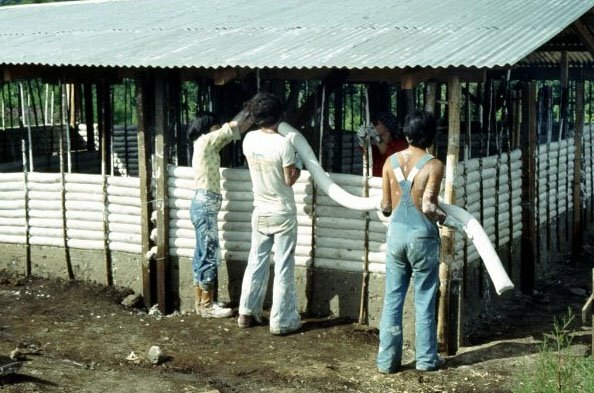 Obviously the concept of constructing homes with fabric bags of mineral material predates Nader Khalili’s earliest experiments by many years, and I was certainly not the first to experiment with filling earthbags with pumice! The entire chapter is reproduced as an article at www.greenhomebuilding.com.